I hope everyone had a lovely Valentine's Day! I did. I ended up keeping my Nicole I've Got The Power topped with Love Your Life mani from my previous post. I love it so much, I'm still wearing it. This polish wears like iron- I did my mani with no basecoat or topcoat and three days later it barely has visible tipwear and is still smooth and shiny. I'm impressed! I was thinking about doing a red glitter manicure for Valentine's Day. I am not really a red person, but I love red glitter. There's something about it that's just so pretty and interesting. 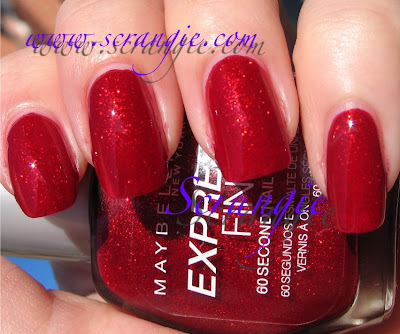 One of my favorites is actually a Maybelline polish: Red Comet. Isn't it pretty? You might need to view it in full size to see the glitter. Fright Night Claw Polish Spellbinding Top Coat in Voodoo. Some of my most favorite red glitter polishes take it to the next level with holographic glitter instead of red glitter in a red base. L'Oreal Bijou Crystals B. Daring. Sally Hansen Nail Prisms Golden Tourmaline. Technically it's a straight holo and has no glitter, but it's sparkly so it counts, right? These are just a few of the red glitter polishes in my collection. They're just so beautiful, I can't resist them! They look like fire on your nails, or glimmering rubies. They're fascinating. If you're like me and not really into plain red, you might feel differently about red glitter. WOW! Pretty. Very Pretty. Thank you! i'm not a red/pink/berry person at all, i'm more into blues and greens. however the day i decided to put on china glaze ruby pumps i was just like "okay, you are the exception"
Wow @ the Essie one. I might have to track it down now. Ruby Pumps from CG is my favorite. Faith, that's definitely one of my favorites! Sadly, I don't have a very good picture of it so I left it out :) One of the best polishes ever! Linds, it is spectacular, totally worth hunting for! Phyrra, I loooove Prisms, I can't believe they discontinued them! I love Ruby Pumps as well, it's so wonderful! red + glitter = LOOOOOVE !!! i'm so craving that maybelline one, please tell me it was not LE or HTF!!! Wow love ALL of these!! :) Red really suits you too. I know what you mean by photographing Ruby Pumps, mine always looks c*** when I try, but it's so fantastic irl. The Ruby Slipper polish from Essie is TDF!! P.S. I found your blog a few days ago and I have really enjoyed indulging in polish love! Thanks for the great photos. This is a personal request, not for any other purpose(marketing etc. ), but as per the issues with picture stealing i thought it to be appropriate. I would just like to ask permission of all of you (my favorite nail bloggers) to save pictures to my personal lemmings list, I have narrowed it down to the easiest form of keeping a list of what i see and love on all of your blogs. I will not be posting them, the only people who would see them are friends, so I would only be advertising your sites if anything :). Just thought I would ask. Take care everyone and keep up all your hard and BEAUTIFUL work. For some reason, my favorite red is Pretty and Privileged! I don't know =T I just like it out of all the glittery reds =_=;; Lame, huh? Ish, it was seasonal, I think it was limited edition, but they have been very plentiful at discount stores lately! Lina-Elvira, awwe thank you :) It's so hard to capture! Every picture I take of it is bad, I need to practice! Anonymous, that's not lame at all! Everyone has their own favorites and their own individual tastes :) I think Pretty and Privileged is gorgeous!